We are working closely with the architect on a greenfield development on Montenegro’s Adriatic coast, south west of Sutomore, creating a 3D digital model to determine the optimum roof forms. Ramboll is providing masterplanning, structural, building services, façade, acoustic, geotechnical and marine engineering services for the project, which includes detached housing, apartments, a spa with hotel, restaurants, retail areas and associated infrastructure. The site is fringed with heavily wooded slopes to the west and south, with a grassy plateau in the central area. A steep rocky peninsula forms its southern tip. The area is seismically active and the ground conditions are being assessed further for the detailed geotechnical design. The buildings are concrete frame with pad foundations. All designs comply with current Eurocodes, and most of the existing trees are to be retained. 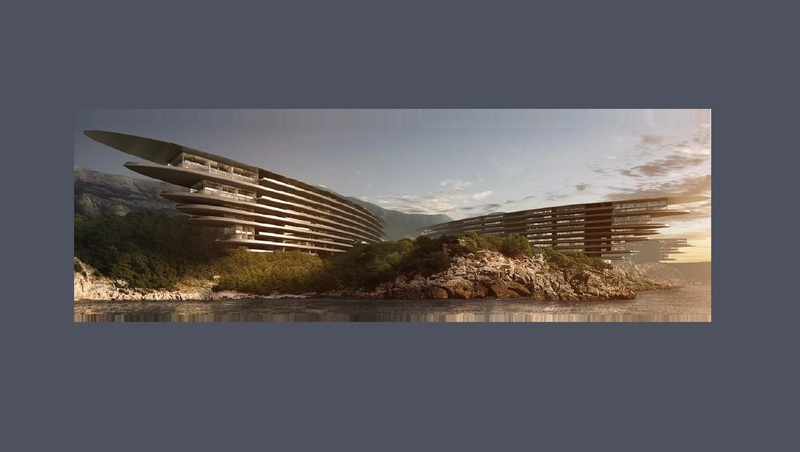 In the current plan, a two-storey hotel and spa building, with single-storey retail units and a helipad, is located on the eastern side of the site, close to the resort entrance. The slopes are dotted with 30 three-storey villas facing the sea, each nestling into the hillside and shaded by a double-curve timber roof. On the plateau are 25 kidney-shaped two-storey villas, roofed in timber and each with a swimming pool. The peninsula features a 300m long sinuous building, with steel wrap-around roof, that follows the contours of the rock and accommodates up to 120 balconied apartments in up to seven levels. Another helipad is situated at the end of a new curving jetty. The 3D model for the villa roofs enabled a determination of the minimum roof overhang for the degree of internal solar shading required, and optimises the quantity of timber required. The roofs have simple orthogonal joints.